Contrary to Alex Garland's disappointment that Paramount sold his film to Netflix, it might be a good thing for film nerds. Alex Garland's new sci-fi thriller, Annihilation, is a good movie. Borrowing a premise (and not much else) from the novel by Jeff VanderMeer, the film follows a team of five military scientists and medical professionals as they investigate unusual phenomena in a remote swamp. It's a thoughtful, well-acted, and visually interesting story that explores different ways of understanding and engaging with the concept of disease through an unexpected lens. It's also not making much money. Although the trailers for Annihilation try to market it as something close to Anaconda, Deep Blue Sea, or Jaws, it's not an action-adventure movie, a creature-hunting movie, or even that much of a thriller. Its closest cousins are films like Moon, Contact, or the introspective, slow-burning curveball Sunshine (also written by Garland). Although the team is attacked by more than one creature after entering the diseased area of swamp known as "the shimmer", most of what they see is more benign and ambiguous. The shimmer seems to be a place where plant and animal genes are fusing and mutating in ways they shouldn't. As protagonist Lena (Natalie Portman) explains, the things they see aren't always ugly and frightening, but they're clearly unnatural. Although the film's been criticized for opening with a scene that reveals Lena as the sole survivor of the mission, the middle act is a tense and thoughtful exploration of how each character responds to the problem of realizing that the shimmer's disease is inside them as well. Rather than being anticlimactic, it builds on Lena's enigmatic testimony that two of her teammates are definitely dead, and the other two... no one knows. This is followed by a final act that spills into disquieting surrealism as Lena finds the source of the shimmer, an entity that's only defined as "unlike us". 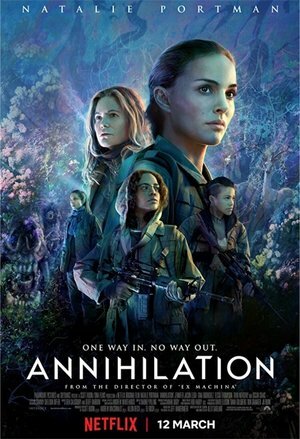 Annihilation has "cult following" written all over it and, while it seems ambitious to think it could recover its reported $50 million budget, it's also not totally outlandish (for comparison, Box Office Mojo lists Sunshine's worldwide gross at $32 million and Garland's last film, Ex Machina, at $37 million). Still, most of the press about Annihilation is not about the film itself, but rather, about Paramount's apparent lack of confidence in it. Besides advertising it as being broader than it is, the studio signed a deal to sell the international rights to Netflix rather than opening the film in theatres worldwide (it's screening only in the USA, Canada, and China). There are several articles analyzing why this is, financially, the right decision for Paramount, even if it's disappointing to Garland, and it's hard to argue with the logic. The films Paramount was banking on recently didn't perform as expected, the studio changed CEOs and, reportedly, Annihilation didn't seem super accessible at test screenings (makes sense). Reading between the lines, it's also possible to speculate that the studio might have been hoping to repeat the success of Arrival, which is serious and introspective but still accessible to mainstream audiences, and brought in over $200 million on a $50 million budget. It's important to note that Arrival, while on the more creative side as far as mainstream movies go, doesn't hold a candle to Sunshine, Ex Machina, or Annihilation in terms of how much it demands from audiences, and how few answers it's willing to give. It's aimed at casual movie goers who maybe aren't into sci-fi and need the movie to explain what's going on, which is where we arrive at an important distinction: not all movies are (or need to be) made for popularity, just like not all movies are (or need to be) made for cinema nerds. Therefore, it's not surprising that the audience for Annihilation seems to be smaller than the audience for Arrival or Star Wars: The Force Awakens. It's a wonderful thing when a film manages to to strike a chord with many different types of viewers, but most of the time, there's a difference between artistic works created for casual consumers and the ones for serious nerds. It's the same in every field, not just movies: couture is serious nerd fashion, concept cars are serious nerd automobiles, those "deeper cuts" from NPR are serious nerd music. The audience for serious nerd stuff is always smaller than the audience for consumer products, not because people are philistines, but because each of us has a limited amount of caring to pour into hobbies, and we each make different choices about which particular thing to get nerdy about. The question isn't "How do we get more nerds?" The question is, "Knowing that there aren't as many nerds, how can we make sure there's space for the serious nerd stuff to flourish?" In the film industry, the answer has been that nerd stuff either needs to be cheap or it needs to be financed by profits from mainstream movies. Just as publishers offset losses on good but unpopular nerd books through mass-producing 50 Shades of Grey and all its sequels, film studios finance good but unpopular nerd movies through stuff like The Fate of the Furious. It's not a contest over which type of product is more important or worthy; it's an ecosystem where both things exist in a balance. What happened with Annihilation is that it cost a little more than a nerd movie usually does (the sweet spot seems to be around $30 million) and Paramount's tentpoles tanked right before it came out, which suddenly makes it seem less like a minor risk and more like what could be a serious mistake. The sale to Netflix is unusual, because it wasn't planned from the beginning, but it's not necessarily a bad thing. While we bemoan the lack of innovation in mainstream movies (and while studios double-down on franchises and sequels so that they can make money), subscription-based services like Netflix and premium cable are having a small renaissance. It may be that, in the future, nerd movies are sustained through deals like this. Garland is right when he says that there's a difference between making movies for the big screen versus movies for TV and internet viewing — the difference is both technical and reputational, and it would always be better if everyone associated with a film knew where and how it was going to be released as they were working. However, removing the surprise factor, it might be a good thing if platforms like Netflix got into the business of financing niche content produced by major studios. There's a special feeling that comes from watching a movie in a theatre packed with people who are just as excited to be there as you are — that's true for nerd movies as much as consumer films, though the only time I've truthfully been in a fully packed nerd screening is during a film festival. We already know that a majority of Americans would rather watch movies at home, and we might be reaching a pivot point in film distribution where the best way to sustain the really nerdy films is with better VOD and streaming options. This is bad news for people who like the cinema experience, filmmakers who (rightly) want the validation of being on the big screen like they dreamed when they were children, and people who own and operate theatres — including those that specialize in nerd movies. It may not be the solution we want. However, if the solution we want involves keeping nerd movies in theatres, it's important to recognize that, under the existing model, that means the tentpole movies need to make money; that is, studios need to do the opposite of what most reviewers recommend and continue to focus their efforts on developing sequels to sequels where CGI things fight each other. That's the fuel that keeps the machine running. There isn't going to be a sudden multitude of nerds to sustain the whole thing. It will be interesting to see what Paramount does in the coming years and, in the meantime, fellow nerds with international Netflix subscriptions will have the opportunity to watch a really good work of sci-fi. However, if we want to keep the thing we love, and be able to watch it, we need to stop pretending that that thing will ever be popular and find solutions where unpopular movies will thrive.